Seven people living in an historic row of Norfolk cottages have spent a second night in a local community centre after fire destroyed their homes. The thatched cottages in Weeting near Thetford caught fire on Sunday night. 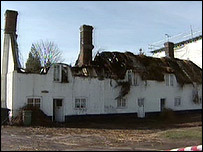 Fire crews were unable to save the four cottages, owned by the Peddars Way Housing Association. It was the second time in six weeks the terrace - said to be the longest single row of thatched cottages in England - had been damaged by fire. Two of the cottages were damaged by the fire, the other two suffered water damage as firefighters fought the blaze. Fire investigators remain at the scene and it is not known when the residents - who include two young children - will be able to return to their homes. A spokesman for the housing association said they were in the process of finding alternative accommodation for those affected by the fire. The Grade II listed cottages are believed to date from the 18th or 19th Century.